There will be an ” March for Life, MD” on Monday March 13th 2017 from St. Mary’s Church in Annapolis following a Catholic Mass at 5:15 P.M. They will process to Layers Mall, here from some guest speakers and return to St. Mary’s School for sandwiches provided by Chic-Fil-A. The procession will be led by the Knights of Columbus Color Corps. March 10, 6:00 PM, at Ft. Meade, Main Chapel (place is subject to change). March 31st 3:00 PM at Our Lady of the Fields (for those who don’t drive at night and those who work nights) light refreshment will be provided and a short talk about who the K of C? Our St. Patrick’s Dinner and Dance is just around the corner on Saturday, March 18th 2017 at the Council hall doors open at 6:30 P.M. 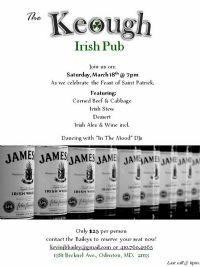 There will be Corned Beef and Cabbage, Irish Stew, Desert, Dancing, and so much more with wine and Irish beer provided. Music will be provided by DJs “In the Mood” Tickets are $25.00 each. 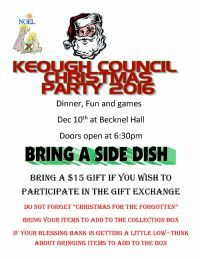 Contact Kevin or Carol Bailey to get your tickets Kevin’s email address is otto449@yahoo.com . There will be an Ice Cream Social /Benefits Night on Wednesday, March 22nd 2017. Mike Barrett will be talking about new benefits offered to the council members and guest speaker Brother Knight Mr. Dixon an attorney specializing in Wills, Trusts, Estate Planning, and more. He will answer your questions and concerns. 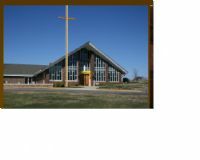 Catholic guest of family, neighbors, and the parish are invited to attend. So pass the word, this could be used as an incentive to bring a new member into the Council and you get the credit. There will be a Spaghetti Dinner at the Council Hall on Friday evening April 21st . More details to come later. Brother PGK Shawn Allen is looking for some help to organize this event. BAILEY TO THE TOP” It is the least we can do. fundraising for travel expenses. Money will also go towards a donation to the service sites. and let me know of any intentions you may have. God bless. R. C. Fisher, PGK —What would Rich Do? 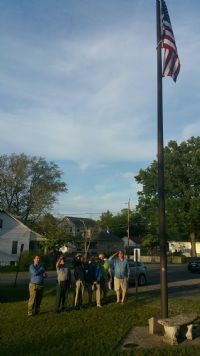 On the evening of May 20th in the Year of Our Lord a new American Flag was raised high above the grounds of Keough Council. You would have been proud to see Joe, Steve, George, Derrick, Don, Roger and Bob give Old Glory a tribute salute. Now you should ask about me, your GK. I was taking the picture with a tear in both eyes. That was my salute. You know patriotism sometimes is no farther than the space between your ear, your eye and your heart. There is something about a new flag that sort of makes me think. How many eyes will look up at our flag and think: Thank God for this country; God Bless America; Freedom is not Free; Liberty and the Pursuit of Happiness; Those Knights are a good bunch and I feel safe parking my car here; etc. You can add you thoughts. The Fort Meade Roundtable is part of the Keough 5263 Council. The Round Table meets on the 1st Saturday of each month at 8:00 am at the Chapel Center. The Knights of Columbus, with more than 1.8 million members, is the world’s largest lay Catholic fraternal service organization. It provides members and their families with volunteer opportunities in service to the Catholic Church, its’ pastors and their community. The guiding principles of the order are: Charity; Unity; Fraternity; and, Patriotism. Knights are Catholic men, 18 years of age or older, who are committed to making their community a better place, while supporting their church. Being a Knight is more than camaraderie; it is being involved with your community; it is supporting the Church while enhancing your own faith; it is about protecting and enhancing your family life. KNIGHTS OF COLUMBUS IS AN ORGANIZATION THAT IS CONSTANTLY REACHING OUT TO ALL INTEREST. 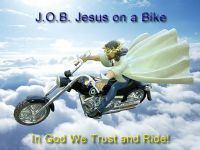 WELL, KNIGHTS ON BIKES IS AN EXCELLENT AND SPECIAL AVENUE TO EXPRESS YOUR FAITH AND PATRIOTISM. KEOUGH COUNCIL CHAPLIN, FATHER GEORGE WILL SOON THE RANKS OF "KNIGHTS ON BIKES". If you are wondering what makes Knights on Bikes so special, the following will explain the kind of feelings that we experience when several motorcycle-riding brothers collaborate. - Enjoying camaraderie with different brothers of all councils, spreading the faith and word of the lord. 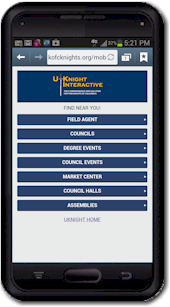 - Being able to visit a brother Knight in other councils, cities, states, and being regarded as one of the family. - Riding in parades, visiting nursing homes, and reaching out to helping those in most need. - At the service of the Bishops, Priests and Catholic Parishes. 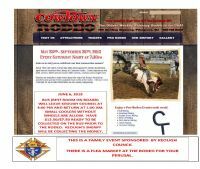 - Raising money for the needy (“Fill the Helmet” fund at a well traveled intersection, Bike show, etc.). - Endeavor to formulate rallies and parades. - A member of any Knights of Columbus council through out the world. - Must own a motorcycle (of any kind) or anticipate owning a bike within 6 months.